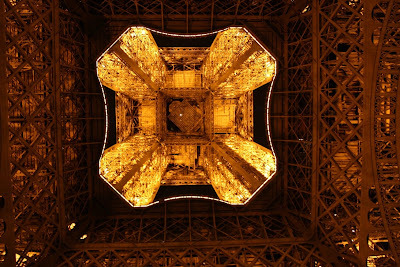 July 2009 Memories: Exploring Paris | Teefa Says..
Let me show you how to discover Paris in one night and have a blast while doing it! -if i'm not mistaken, we booked our package 2 months in advance and got a deal for GBP90 per pax. 2) Bring your bestfriend along to enjoy the feeling of bergedix-gedix di Kota Paris. 3) Bring your boyfriend along to get the feeling of beromantik-romantik di Kota Paris. We made our way to St. Pancras as early as 4.30 in the morning memandangkan keretapi kami dijadualkan bertolak pada 6.55AM. Mengantuknya hanya Tuhan saja yang tau! Sesampai nya di Paris Gare du Nord station, haruslah bergambar macam org tak penah jumpe train station kan? Hero dan heroin filem berkeretapi. Puas bergambar, we made a move to find our Hop On Hop Off Bus station. To our surprise, no signboard was available. Kerja membelek peta pon bermula dan akhirnya jumpa jugak bus station nyer! Weeeeee.. We hopped on the bus to get to our hotel ASAP and check in. Gotta get rid of these bags! We hopped on the bus enjoyed Paris's gorgeous view. Walaupun penat kami gagahi jua! Because our hotel is nearby Eiffel Tower, we hopped off at Eiffel and decided to look for the hotel on foot. Kononnye boleh la sambil cari hotel sambil jalan2 enjoying the view. It turned out kami sesat. Ugh! After almost one hour of walking, baru lah jumpe hotel itewww.. The hotel is not bad, a bit small though. Yang penting bersih, ada katil and ada toilet. OK la for a one night stay. Sampai hotel mandi jap, rehat jap then terus keluar. No time to waste bebeh! Ohhh, we were starved. Luckily there's a Lebanese restaurant just next to our hotel. Melantak la ape lagi kan? Even the hotel corridor pon kecik! Found this place on our way jalan-jalan from the hotel. Don't even know what building that is. Finding halal food is quite hard in Paris. My friend said there's a halal KFC but we can't find it. We ended up choosing a restaurant that doesn't serve pork, as stated in the menu. We just ate fish n' chip, ommelette, and some fries. Sungguh tak kenyang! Cukup alas perut je. We continue sight-seeing that night to Eiffel once more. Man, she was gorgeous at night! i don't think i'll get bored of the sight. Even the very VERY cold weather couldn't turn us down. And she glows and sparkles when the clock strikes twelve. The most breath taking view. Time to go back. Our very pink limo is waiting. HA HA! Our first day seems quite short despite arriving early. Ye lah, dah sesat kan. It doesn't really help when the local people don't really speak English. We continued exploring with the little time we had left on the second day. To optimize time, we checked out of the hotel early morning and Shaq and i went to Paris Gare du Nord to re-check on the train schedule and put our luggage in the locker while Mr. Chenta went to Eiffel tower to buy the entry tickets (God, you can't believe how crazy long people queue just to get the tickets!). We came back to Eiffel just in time after he obtained the tickets. Hehe. Home is 10 433km away. i got home sick when i saw this. Sobseb! We then continued our journey to Musee du Louvre, bought some souvenirs, stroll along Avenue des Champs-Élysées, and a quick visit to Arc de Triomphe before dashing off to Paris Gare du Nord to catch our train. We were in a mad rush! In the end, we missed our train (despite arriving 20 minutes early! Ughh!). Luckily the people at the counter were so nice and let us board the next train to London. Phew! There's a Louvre at the end of the tunnel. i love you, you love me..
i love art stalls like this. They have plenty in Paris. Beautiful yet cheap paintings. One of Paris' many beautiful monuments. Last stop: Arc de Triomphe. Bicycles are everywhere in France. For rent. Eco-friendly sungguh! 4) Souvenirs = 50 Euro for both Mr. Chenta and i. 1 comment on "July 2009 Memories: Exploring Paris"